Being a foodie, I love to try new things. Husband and I have been talking about going on vacation to a city with a good selection of dim sum restaurants. Being a Firefly fan, I like to try things I see on that dearly departed show. Now, I’ve a lot of experience with fresh strawberries and “fresh” wine (albeit not from Caylee’s inter-engine fermentation system. For Vel’s fermentation system, see recipe below), but not so much with creating anything but a stir-fry from the Orient. So, being bored and having some pulled pork in the freezer from a recent meal (this recipe here; very tasty), I decided that making bao could be entertaining. Understand that I’ve never had bao before so we’re working with expectations created by the interwebs. The recipe for the bao dough comes from here. The dough is amazingly cooperative, and is not the usual tarbaby I work with. I cut the dough into the pieces indicated on the blog entry and rolled them out with my regular sized rolling pin, thinning out the edges with my fingers. For the filling, I took my pulled pork, moistened it with hoisin sauce, tamarind concentrate and a squirt of sriracha. Sorry, no strict amounts, just make it moist. The pork is cooked so you can taste as you go. Warning, if the filling is too moist, it’ll simply squirt everywhere when you go to seal up the bao. Note: (added a bit later on 1/21) I used my old metal steamer, the one that looks like a radar dish when spread out. I put it in a large pot (the stewpot from a standard set) so it was mostly flat. I then put a sheet of baking parchment paper under each bao. Worked like a charm. 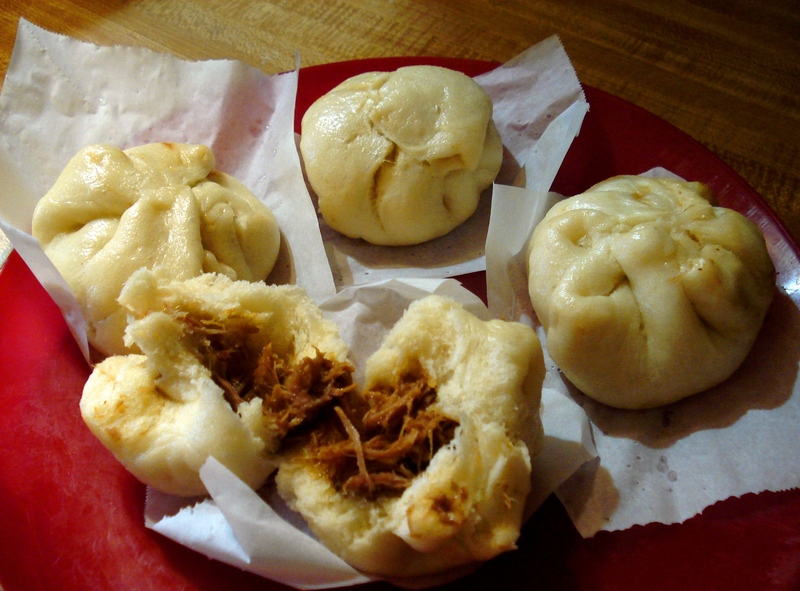 But watch, the “radar dish” likes to tip, so put the bao on across from each other to balance. Now for the results, they are very, very good. At least, I think so again with nothing to compare it to. The steaming leaves a lacquered shine on the bao, and the dough becomes slightly chewy, but still spongy and fluffy. The flavor of the dough is very clean and fresh, and I think that’s because it has no salt in it. Most folks from the western cultures aren’t used to having no salt in their bread-type products. As the Stresscake blog entry says, they keep nicely in the freezer. They also microwave well after cooked, if nuked for about 10 seconds. They worked so well, I am definitely getting the cookbook they came from: Asian Dumplings by Andrea Nguyen. This weekend we’ve also made another Brewer’s Best kit, Belgian Golden Ale. Don’t see it on their website anymore, so I don’t know if they may have ceased production of it. There will be a post about it when it finishes up. Bring 1 quart water to boil and dissolve the sugar in the water. Remove from heat and add frozen concentrate. Add additional water to make one gallon and pour into jug. Add remaining ingredients. Fit airlock. When clear, rack (pour or siphon off what’s clear into another bottle), top up and refit airlock. After additional 30 days, stabilize (Campden tablets are a preservative and are found at home brewing places) sweeten if desired and rack into bottles. My suggestion is just be ready to drink it. It’s fresh, you know. ain’t no power in the verse gonna stop me from making these. Thanks. great! See the note I added about my steamer.